Shuck and Jive: Hike to Grassy Ridge Bald this Saturday! 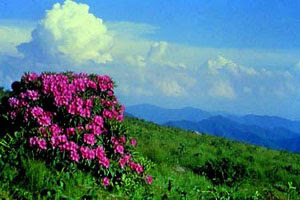 Join us for a hike this Saturday to Grassy Ridge Bald! The Peacemaking Committee is sponsoring a hike to Grassy Ridge on Saturday, July 14. We’ll walk from Carver’s Gap on Roan Mountain through a high-elevation Spruce-fir forest and over the globally rare grassy bald ecosystem unique to the Highlands of Roan. Allow about four hours for this hike. Bring layers of clothing, water, hiking shoes and a lunch for a picnic break along the way. We’ll leave from the church parking lot at 9:00 a.m. or you can meet us at Carver’s Gap at 10:00 a.m. The Southern Appalachian Highlands Conservancy is also planning a hike to Grassy Ridge on that day, so it will be a good opportunity to meet and talk with those folks.